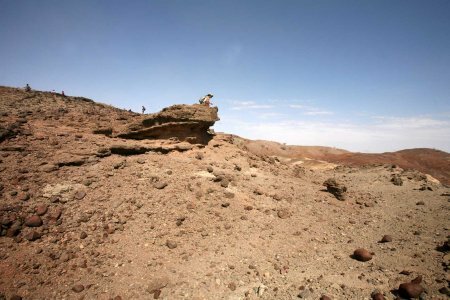 Moruorot is found in the badlands north of TBI basecamp, on the west shore of Kenya’s Lake Turkana. 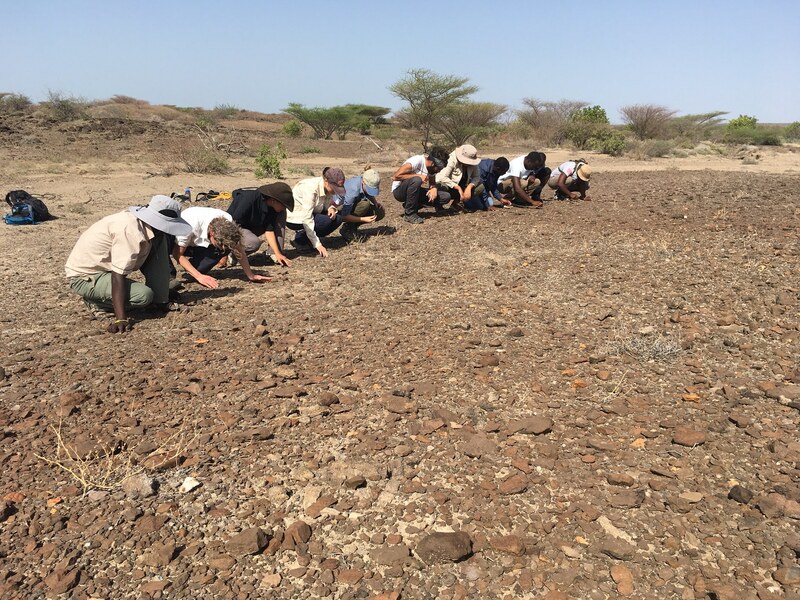 Literally meaning “Orot’s Hill” in the local Turkana language, the site of Moruorot is dominated by a great hill around which lie beds of exposed and fossil-rich sediments, wearing away for the last 18 million years. 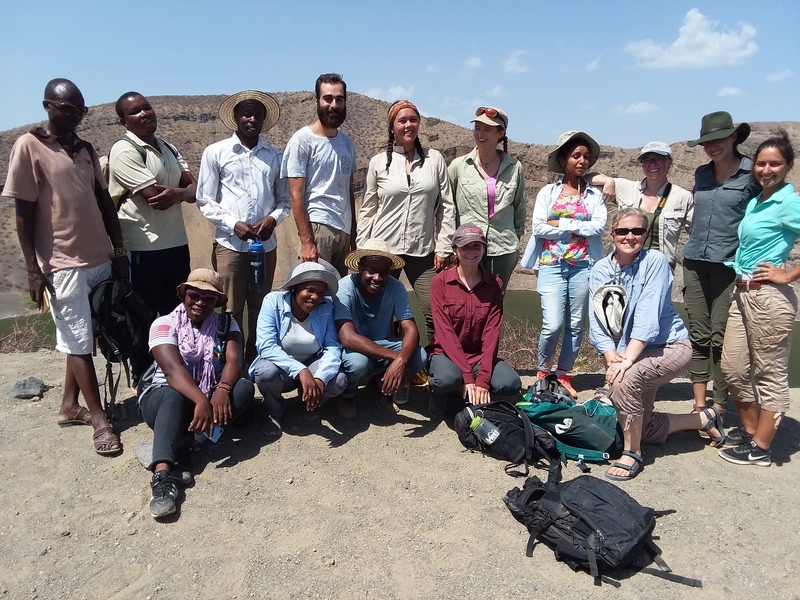 Instructor Cara Roure Johnson and Meave Leakey led TBI Field School students to Moruorot on Saturday to search for fossils, and better understand the context of primate evolution in the Miocene. 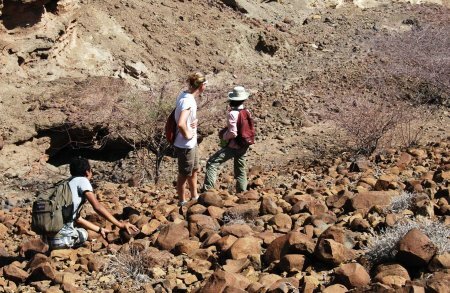 The excursion was successful in this sense, but students found more than simply fossils in the mazelike landscape beneath Orot’s Hill. 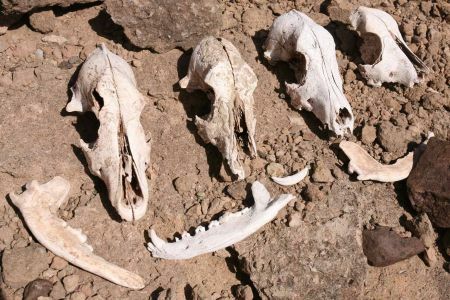 The skulls of shepherding dogs found in a den belonging, unexpectedly, to a hyena. The Moruorot beds were deposited by rivers and floodplains, above a thick layer of volcanic rock, about 18 million years ago. 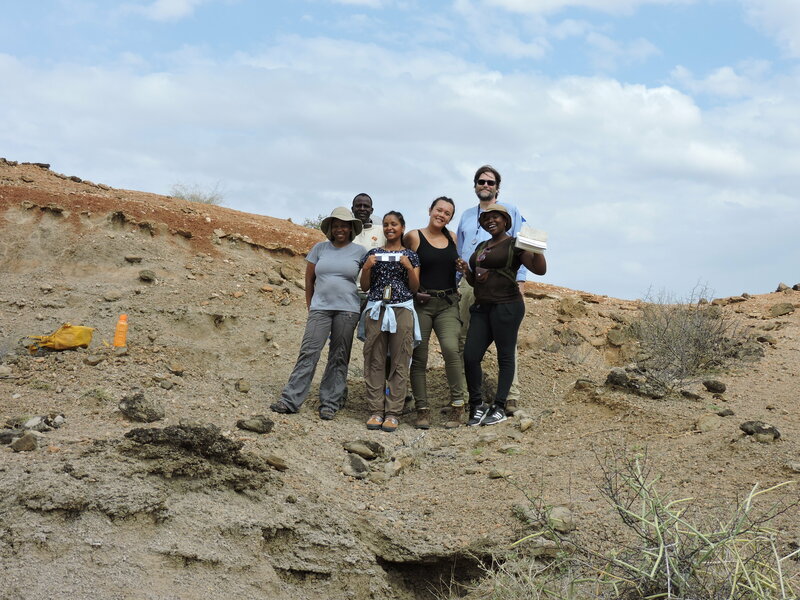 Now exposed by erosional processes on the west side of Lake Turkana, they form an important part of the Losodok range, from which many early and mid Miocene (23 to 5 million years ago) fossils have been retrieved. 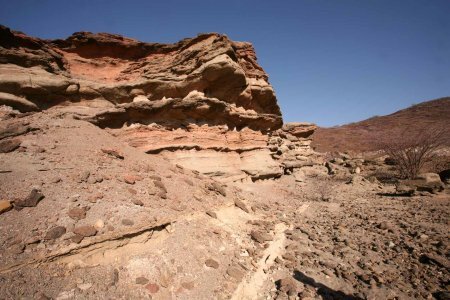 The beds are composed primarily of sands and clays, sometimes cemented by limestone, and their exposed surfaces show evidence that a river system with deep channels and wide floodplains once coursed through this region. Now, small ephemeral streams, flowing only a few months of the year or less during rains, have over millenia eroded the earth to reveal the ancient river and floodplain system. 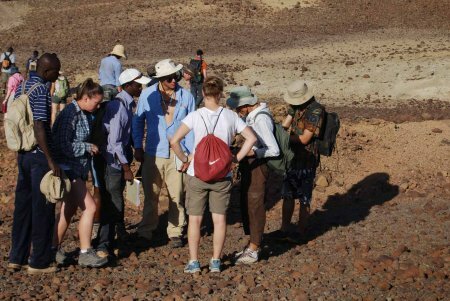 TBI Field School students set out early on Saturday morning morning with Cara and Meave to explore Moruorot, hunt for fossils, and contribute to our understanding of the early Miocene. 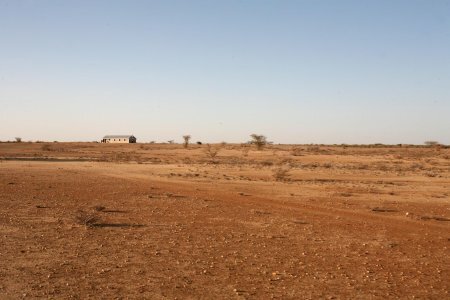 A church overlooks the lonely desert landscape on the way to Moruorot. 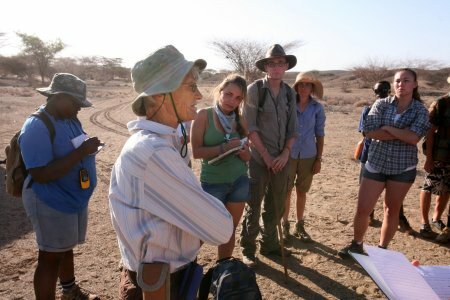 Meave gives students a brief history of the site, and explains which areas may be likely to yield fossils. A notebook rests below exposed clay strata at Moruorot. The layers in the photograph above are composed primarily of clays, fine sediments that are swiftly swept away by fast currents, but held by lakes or floodplains. 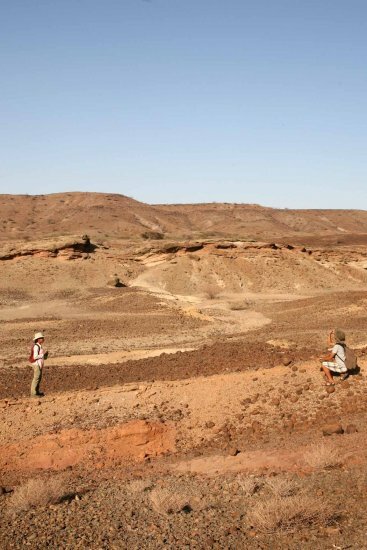 Their presence here suggests that a river system running through the region 18 million years ago would repeatedly overflow its banks, allowing the clays to accumulate and build soils on the river’s flanks. Sandstones and claystones extending 10 meters into the air. 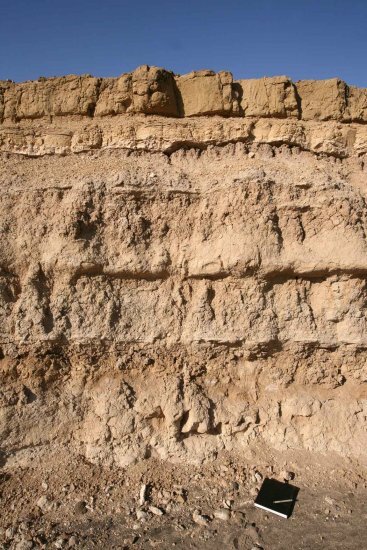 While the floodplains would accumulate clay soils, the river would deposit layers of coarser sand, or even pebbles. Small troughs in the layers of sand are relics of ancient riverbeds and their undulating surfaces. 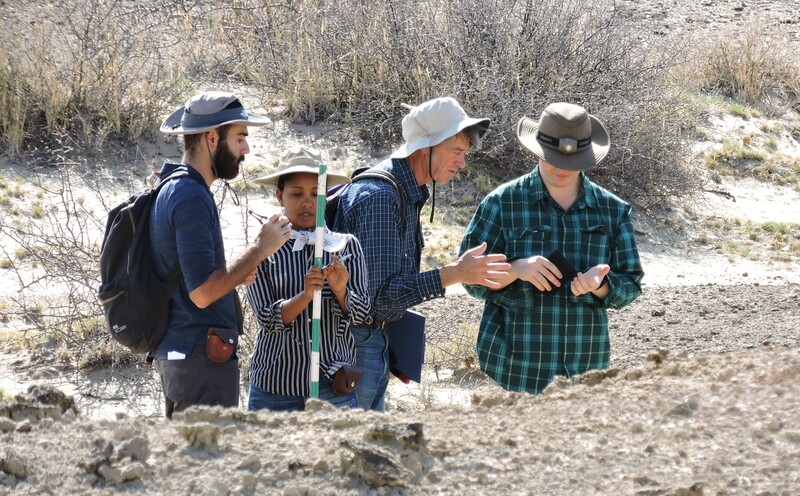 Meave and students find a fossil. Fossil finds are always a source of excitement. Above, Francis, Sonia, Like, Peter, Debbie and Quan gather around Meave to hear her thoughts on the newly discovered specimen. Kelly and Alec talk to pass the time, while looking for fossils. Successful on the southern end of Moruorot, Meave led students to the north, on the way passing over the hill, Moruorot peak. Views of the badlands from above were stunning. 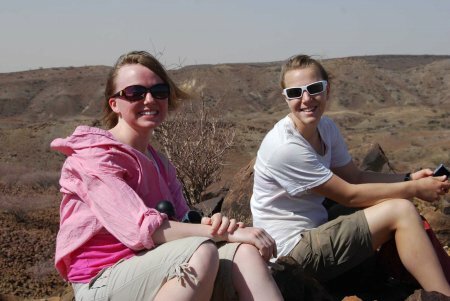 Kasia and Debbie above Muruorot peak. 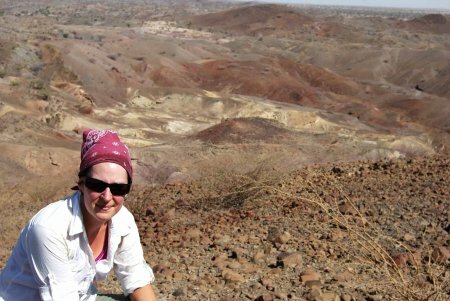 Cara Roure Johnson on Moruorot peak, with fossil rich sediments in the background. Sometimes small fossils are more exciting than big ones. 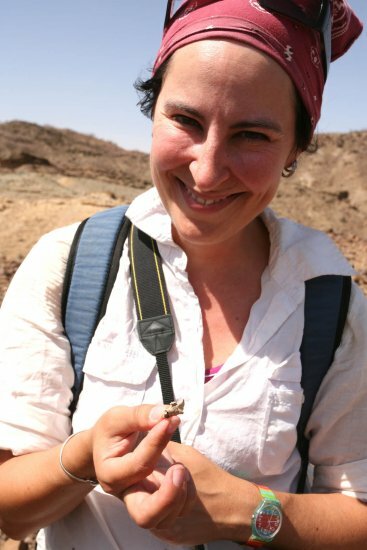 Above, Cara holds the jawbone of a rodent, one of the smaller inhabitants of Moruorot’s ancient floodplain system. Though small, rodents provide a wealth of critical information about an ancient environment’s ecosystem. 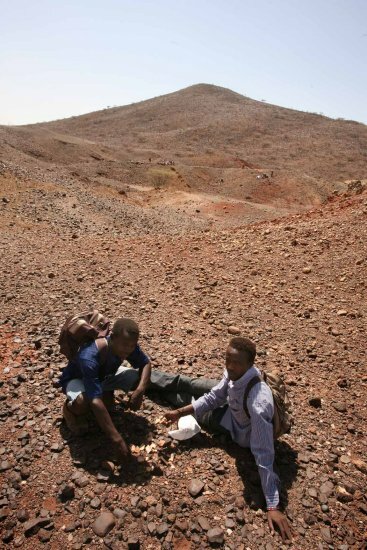 Ken Anakoli and Luke Lomeiku sit to study a series of fossils they’ve found, with Moruorot looming behind them. 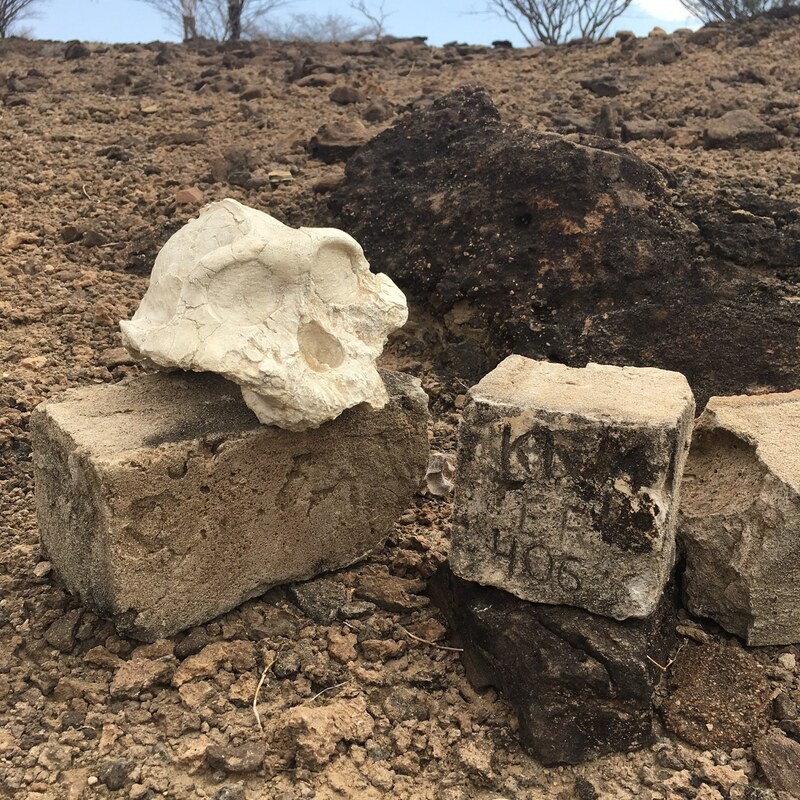 The recent remains of a goat, adjacent to a far older human burial, outside Moruorot. 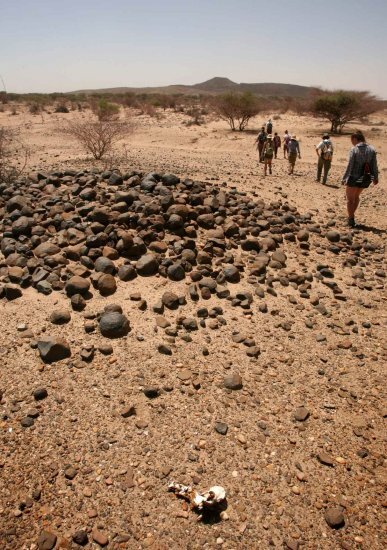 Walking along the northern beds of Moruorot, students began to find a great number of goat skeletons strewn disconcertingly across the landscape. Dog crania and mandibles arranged in a line at Moruorot. More surprising still were a series of dog remains intermingled with those of goats. The crania bore a strong resemblance to the local Turkana shepherding dogs, used to tend flocks in the barren and wild landscape. Alisha on a sandstone outcrop at Moruorot. Seconds after this photograph was taken, pandemonium broke loose as students spotted a wild animal charging up one of the ravines. A hyena running along a ridge at Moruorot. The striped hyena, cornered unexpectedly by TBI students hunting for fossils, was just as surprised as they. 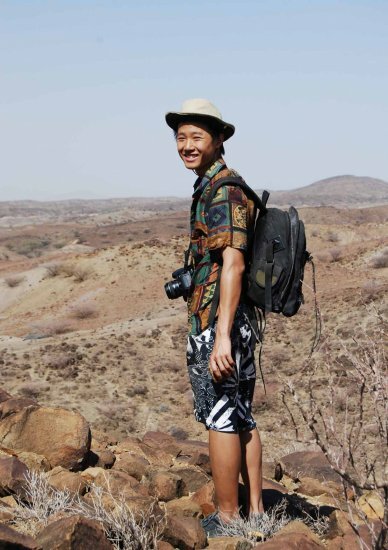 While students ran in one direction, the hyena took off in the other, and soon disappeared into the labyrinth of ravines below Moruorot. Alec, Debbie and Kelly watch with amusement as the hyena and students run in opposite directions. Students trek back to the lorry before leaving Moruorot for TBI basecamp. Everyone was somewhat unnerved, but also entertained, by the surprising appearance of a hyena in the Moruorot beds. 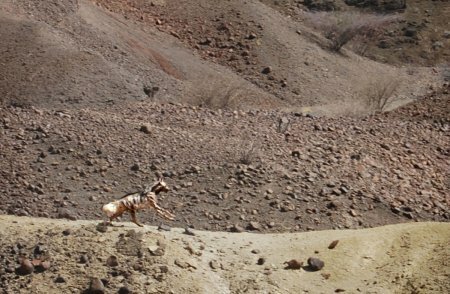 Given all the scattered remains of goats and dogs, we should have expected that some creatures at Moruorot were not as yet fossilized. 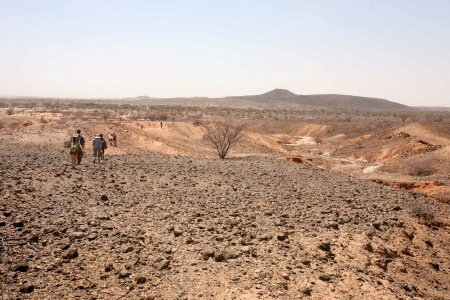 The hyena made off in great haste, and not long after a Turkana shepherd, with staff in his hand and blade around his wrist, came walking down the same dry streambed the hyena had crossed. As frightening as they are, the hyenas are far more frightened themselves of the Turkana, wary of any threat to their flocks.